Our premium 1X Easton compatible, Direct mount Oval chainring is designed for Easton EC90SL cranks specifically. Super stiff, mud optimized narrow-wide chainring is a Perfect choice for Cyclocross and Gravel setup. Eagle 12spd compatible. Easton Cinch(tm) EC90SL cranks and RaceFace Cinch cranks. Eagle 12spd compatible. It is ideal for 1x 9/10/11/12 system and Singlespeeds!. Oval (elliptical) chainring does not compromise the work of clutch mechanism in rear derailleur. It also does not require chain tensioner when using in singlespeed application. Riding out of saddle on the uphill will become more pleasant. These chainrings also help you to recover after knee injuries as pedaling becomes smoother and less exhausting. The World's best oval (elliptical) gravel spiderless traction chainring - period!. 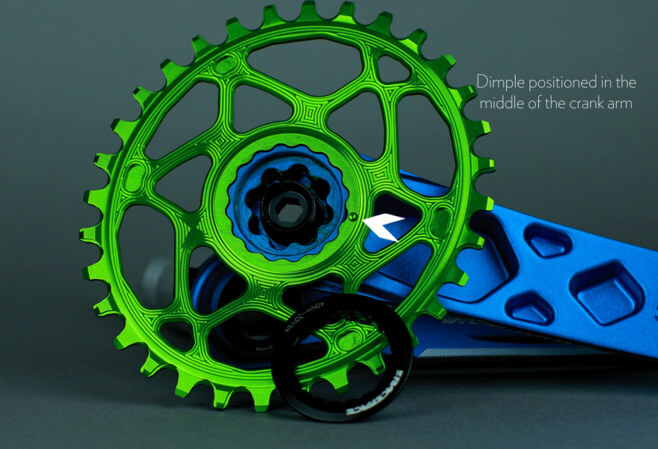 Non circular chainrings, Non-round chainrings. Asymmetrical chainrings. Eagle is a trademark of SRAM; Easton, Cinch, EC90SL are trademarks of Easton and are used for informational purposes only.